In the movie Avengers, Hawkeye seems like a filler character. He isn't in any of the previous movies, and there's no story about him at all. Does he just have super vision? Does he have a back story about it? Hawkeye, like Natasha Romanoff aka Black Widow, is a human, except he is a lot more skilled than most. He doesn't have super powers like Captain America, Thor, or Hulk, but he is a master assassin. 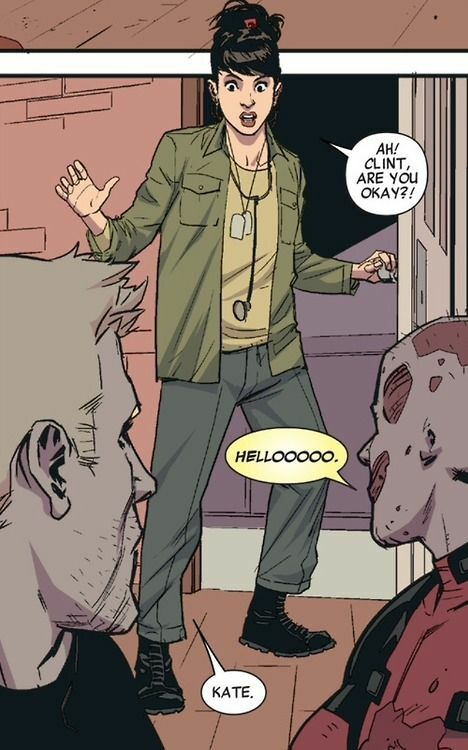 While Hawkeye has no superhuman powers (with the exception of the period when using Pym particles to become Goliath), he is at the very peak of human conditioning; he is an exceptional fencer, acrobat and a grandmaster marksman, having been trained from childhood in the circus and by the criminals Trick Shot and Swordsman. This includes considerable strength, as a supervillain found out when he tried to use the superhero's 250 pounds-force (1,100 newtons) draw weight bow and found that he could not draw back the string to launch an arrow. Hawkeye has also been thoroughly trained by Captain America in tactics, martial arts, and hand-to-hand combat. Hawkeye excels in the use of ranged weapons, especially the bow and arrow, and carries a quiver containing a number of customized "trick arrows". In his role as Ronin, Barton shows great proficiency with the katana and other melee weapons. He has gained a reputation for being able to "turn any object into a weapon", and has been seen using items such as tin plates, coins, sticks and other debris to great effect against his enemies. Hawkeye is far from a filler character. He's been in every Avengers lineup in every continuity (Comics, Animated, Movie ... etc). Movie-wise, this isn't his first appearance either. He first appears in the Thor movie (the same way Black Widow appears first in Iron Man 2). Like Black Widow, he doesn't have any super human powers and his past is shrouded in mystery (at least in the movies universe). Although one can argue that his skill with the bow and arrow is super-natural. In the comic Ultimate Comics Hawkeye #2 there is a spot where it mentions he has higher than normal rod cells. Normal person has hundered and fifty million rod cells and hawkeye has closer to 4 hundred million. Also the muscle around his eye allow for orb distortion giving him the ability to change focal length. This could be argued as a mutation similar to those in X-Men. Which would make him a superhuman/superhero and not just a normal human. Hawkeye has no powers at all, and as for his back story: He and his brother were orphaned at a young age and they both ran away to the circus. Hawkeye was trained by Trick-shot and Swordsman while he was at the circus, but that ended when Clint caught Swordsman counting the money that he had stolen from the circus. Swordsman asked Clint to join Him but Clint refused and Swordsman and his brother, disappointed that he gave up the opportunity, both left Clint. Later Hawkeye left the circus and saw Iron Man so he decided to fight crime as well, but was mistaken for a villain by the police. Black Widow convinced Clint that he hated Iron Man, so Clint attacked him. Afterwards Hawkeye decided he wanted to be an Avenger and attacked the mansion, and then saved it so he would look like a hero. Hawkeye does have superhuman vision in his Ultimate Universe story line. As a result of a super soldier program, he gained enhanced vision and some other perks. However he doesn't have the same in the other Marvel universes/versions. The MCU borrows heavily from the Ultimate universe version. Not the answer you're looking for? Browse other questions tagged character marvel-cinematic-universe the-avengers . Why does Thor try to break out of the cage? Can Quicksilver push bullets out of the way? What God does Captain America believe in? What is the significance in Hawkeye and Widow for the team? Why is Vision so weak? Does Vision have AI capabilities like Ultron?